This End Table perfectly epitomizes the rustic-industrial craze prevalent in contemporary homes. The piece features a gorgeous rustic brown finish over oak veneers that pair beautifully with the textured gray finished metal components. Iron handle hardware and exposed bolt heads further reinforce the aesthetic. As storage goes, you receive a single bottom drawer perfect for stowing away clutter, while the open shelf provides good display space. 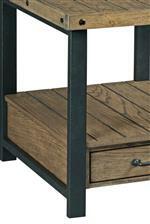 The Workbench Rustic-Industrial Rectangular 1 Drawer End Table by Hammary at AHFA in the area. Product availability may vary. Contact us for the most current availability on this product.